Somebody has to win this game. The Cavaliers will visit the Lakers tonight, and both are coming off of the most embarrassing losses in the NBA this season. Cleveland was dominated by the Kings to the final score of 124-80, getting completely outplayed at every single position. Similarly, the Lakers were pummeled by the Clippers to an embarrassing 123-87 beat down of the hobbled Lakers. The Lakers have been absolutely dreadful for the past couple of weeks, dropping 10 of the past 11 games, only beating the Jazz on the back of Kendall Marshall's 20 points, 15 assists break out game. The team has been lethargic on defense and hasn't been making their three point shots, while forcing a lot of the action. It doesn't help that the team continues to suffer injuries, minor and major. Just last week, Nick Young was having back troubles that nearly held him out of games and this week, Pau Gasol is experiencing some toe problems; he has a moderate strain of his flexor tendon in his big toe of his left foot and is questionable for tonight's game. The Lakers have been shooting a horrid 41% in their last 11 games while allowing 110.2 points per game in this stretch. They've been turning the ball over at a ridiculous rate in this stretch, turning it over 21 times a game. It doesn't help that Nick Young and Pau Gasol haven't been playing well; Young is shooting a terrible 38.5% in this 11 game stretch and Pau has continued to struggle all year long, shooting a career low 44.8% on the season. Kyrie Irving is leading the Cavaliers in points (21.7), assists (6.1) and PER (20.1) and is second in WS/48 (.119 behind Anderson Varejao's .144) though he is only shooting 42.9% from the field. The Cavaliers run their offense entirely through him, running isolations and pick and rolls and fully utilizing his tremendous outside shooting ability and jaw dropping ball handling skills. Cleveland doesn't have the best inside scoring presence, however against the Lakers and their small-ball lineup, that could change between Tristan Thompson and Varejao likely dominating the glass. 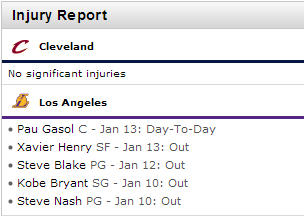 It doesn't help the Lakers that the Cavs are entirely injury free at the moment. If the Lakers want to stop this skid, they need to crash the boards and limit turnovers; you can excuse poor offense if your defense is playing well, but you can't excuse not playing either. The Lakers will need to rotate on time and try to limit the amount of times the big men switch on to Irving, while on offense, the Lakers need to pass the ball and hit the open shots. Somebody has to win this game, though if recent weeks are any indication, the Cleveland Cavaliers will likely come out on top. This season cannot end fast enough.